It was only a matter of time. Many people thought it may have happened the year before. 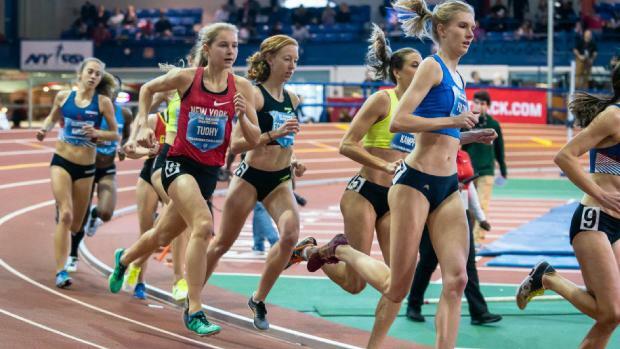 But erring on the side of caution, Katelyn Tuohy's (North Rockland) Coaches resisted the urge to race her against the Pro's as a sophomore. She was still adapting to the new found speed from an XC Season for the ages. It wasn't slowing her down, as she set a new 5000m National Record that year. But it was just about finding the right time to take the plunge. It turned out, the February of her Junior year was the perfect time to raise the bar. 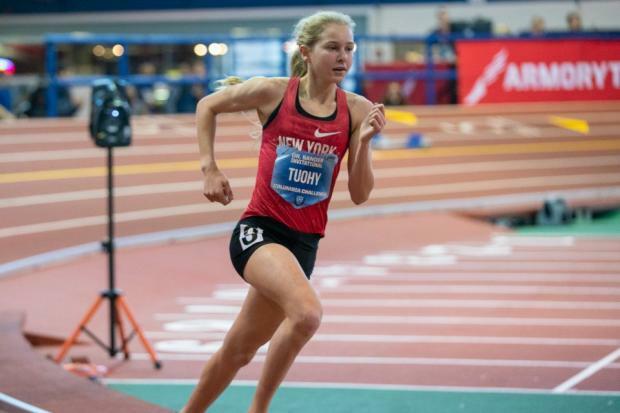 Tuohy entered into the 3000m Pro field at the Doc Sander Invitational, her first ever venture amidst elevated competition. The field included Pro and Post-Collegiate athletes of varying speed, and Tuohy looked right at home alongside. She would run to a new National Record of 9:01.81 in the process. There is a lot to process there. Tuohy's mark bested the previous record held by Mary Cain, at 9:04.51, which was also our State Record. Cain had actually run 9:02.10 while in HS Indoors, but it was run at the Dempsey, an oversize track which is ineligible for Records. At that same track, Alexa Efraimson (Camas, WA) ran 9:00.16, but again, on an oversize track. Only Katie Rainsberger (Air Academy, CO) has run legally faster than Tuohy, but did so Outdoors with a 9:00.62. It makes Tuohy the #2 performer All-Time, and top Indoors. Tuohy and her Coaches have stated that the Pro debut was as much about running fast, as it was about running against that elevated competition. Their stated goal has been to reach the Olympic Trials in 2020, and to race there, she would need the experience. And it was clear, the race played out a little differently than Tuohy has been accustomed to amid High Schoolers. First, it was the first time running with a rabbit. Which also meant, it was the first time Tuohy wasn't leading the race, dictating her own pace. And lastly, there was the biggest differentiator between HS and Pro Racing; the very abrupt gear changes that can happen at any time. Tuohy took third in the field, as the top Pro's dueled it out at 8:56 ahead. Tuohy's placing didn't matter. She ran fast, and gained that needed experience. Now it's back to High School racing for the rest of the Season. She has qualified for the Millrose Games, but has not decided if another strong effort so close to her 3K is a worthy venture. It's a mark of smart coaching, and a knowledgable athlete. As always, the crowd can't wait to see what comes next.